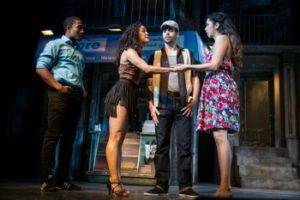 In the Heights at Fulton Theatre is an extremely topical show and a spectacular musical. 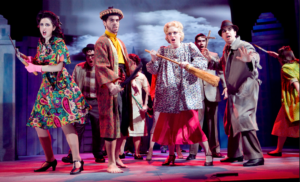 Each member of the cast delivers an engaging performance that is full of passion and energy. The cast brilliantly portrays this story written by Quiara Alegría Hudes with music and lyrics by Lin-Manuel Miranda. One thing this cast does exceptionally well is remind audiences the importance of community, and they make each character significant. 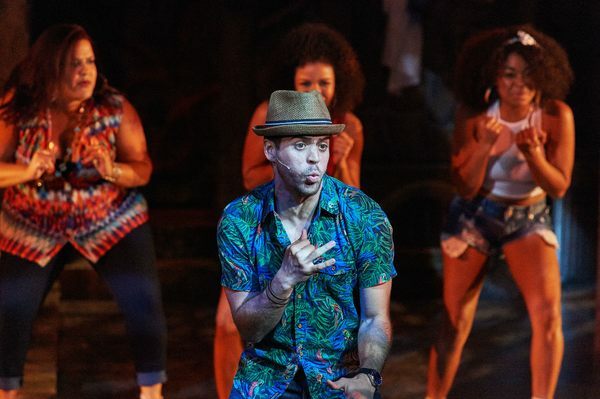 Every time I see In the Heights I fall in love with it, and this production, in particular, has a genuine and enthusiastic cast that audiences cannot help but be affected by the story. 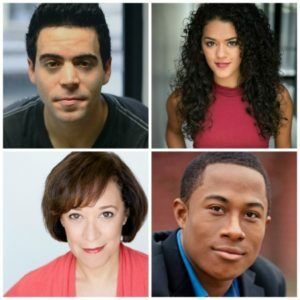 I had the privilege to speak with Diego Klock-Perez (Usnavi), Kalyn West (Vanessa), Daniel Yearwood (Benny) and Debra Cardona (Abuela). Each of them spoke with me about the show, what they hope audiences take away from this show and why Lin-Manuel Miranda’s work, in particular, is important to musical theatre history. Kelli Curtin: Could you tell me a little about In the Heights and what audiences can expect from this show? Kalyn West: This show is about home, however, not the traditional definition of home. I relate to my character Vanessa deeply because personally I have had to find my own home outside of my blood relatives and outside the place I was born. I have had to find a home with the people who have naturally come into my life and created a support group. New York feels like home to me even though that is not where I am originally from. In the Heights is about finding your own sanctuary and finding your own definition of home. Daniel Yearwood: Also, home does not necessarily mean a location or building. Home is a community, the family you have with you. It’s been fun for me exploring this show a second time as Benny and hearing all the nuances that Lin-Manuel Miranda purposely puts into the show. 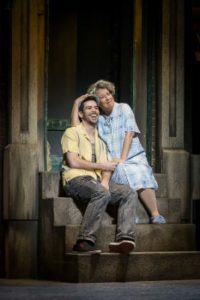 The whole show ends with the motif in the duet between Nina and Benny in the song “When You’re Home.” We are all singing about home at the very end of the show, and we are all expressing what that means to be at home in New York City. In my own personal life, I was born in Harlem moved to the Bronx, and I never really experienced Washington Heights. I experienced a neighborhood just above the Upper East Side right above 96th Street. I got a taste of what the community is like that Lin writes about in In the Heights. Lin captures the essence of the immigrant community very well. Members of this cast have talked that seeing this show as a person who is not Hispanic is like someone who is not Jewish going to see Fiddler on the Roof in the sense that you may not understand the culture right away when you sit down in your seat in the theatre, but by the end of the show you see the same connections you make in your own life with family members or members of your community. That is the message of this show: we may all come from different backgrounds or cultures, but we all connect with people in the same way. Debra Cardona: It’s funny that Daniel mentions Fiddler on the Roof because when I try to explain to people what In the Heights is about I tell them it is like Fiddler, but it happens in Upper Manhattan. This show is also very interesting because it is set during the July 4th holiday, American Independence Day. Here is a community of immigrants that are originally from somewhere else, but they are also American. This show is so clever in the way that Lin places the show during this July 4th period. The bottom line is this show is about community and it is about home. Even if you talk about leaving a place, the community you are a part of is still home. The people in the community are the people who helped make you who you are. I feel audiences will find they have so much in common with these characters. Audiences will find characters that they will relate to and some that they will recognize characteristics of from someone else they have met at some point in their lives. Diego Klock-Perez: I agree with everything that everyone has said so far, but there is also the element of patriotism that goes into this show. The empathy of the show is about empathizing with a new culture. A lot of people who come see this show are equalizing or understanding, either consciously or unconsciously, a different community of people that a lot of the time are looked at as outsiders. I think the show is definitely about contentment, where you want to be as to where you are, and finding contentment in where you are. Also, making sure you do not let go of those dreams that drive us and keep us going. In a way, this show is also about revitalizing or re-identifying musical theatre for people today. We talked previously about how In the Heights is like Fiddler on the Roof, except it speaks in a language that is our current lingo in the twenty-first century. It is written in a language we understand and music that is current, music that we hear and that we are used to listening to. This show is so refreshing because all though my education we were taught that musical theatre has all elements that bring it together like spectacle, music, acting, etc., and that it can be whatever it wants and has no shape and there are things that are always new. However, for so long musical theatre has been so much the same, and this show refreshes people’s ideas of what musical theatre is and what it can be to both individuals and society. For example, currently look at the popularity of Lin’s other musical, Hamilton, he has done so much for pushing the boundaries of what musical theatre is and what can be accomplished by the shows. Could you talk a little about this quote and the importance of In the Heights to musical theatre history? Debra: One of the great things about In the Heights is that he is quoting musical theatre. The scene at the end of act one with the dance at the club is very similar to the “Dance at the Gym” from West Side Story. When Lin said “Look I made a hat” he is giving honor and thanking all the musical greats that came before him. Lin not only uses hip hop and rap, but he uses musical theatre. Lin is a big musical theatre nerd and has the ability to combine all these influences together to create amazing shows. He really is changing the game and is also respecting what has come before him. Kalyn: The way Lin connects popular music and musical theatre is super smart because it creates a chord of connection. It show how we are all intertwined and that we are not so different from one another. This show is humanizing. Diego: He also really created a place for minorities in the theatre, an honest and real place within the theatre. Even West Side Story one of the greatest acclaimed Latin musicals is about a gang, violent criminal outcasts. At the time they presented this show to the audience and they accepted it. It is always necessary to push the boundaries just a little bit to get a reaction from the audience. Lin has succeeded over and over again in creating characters for people who in the past were not invited to the theatre. For example those who were played in blackface, people who were banned from coming to shows, and people who could not enter through the front door. Now all people can come to shows and see other people like them on stage doing things they also dream about. 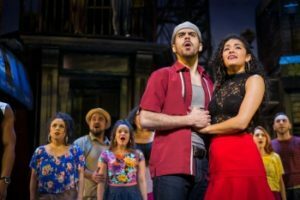 In the Heights is a genuine, honest and human story about people who were not necessarily represented in a positive light onstage before this show. This show is not a stereotype, it really gets back to the empathy, having people sympathize with and relate to the characters in the show. The theatre is not meant to change people’s minds, but it is meant to get the conversation started. Daniel: Lin really is paying homage to the people who came before him. Art is art, and his Art may be different from someone else. That speech is one of my favorite speeches along with Jerry Herman’s acceptance speech from La Cage Aux Folles. Lin uses such intricate language and every word is there for a reason. He has the ability to humanize all the characters he writes about and explores the everyday language we use to communicate with each other. For example, Benny and Usnavi have their own lingo they use to talk with each other. All the characters in this show find strength in others in their community. 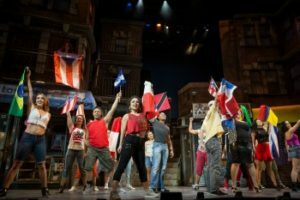 Kelli: What do you hope audiences come away with after seeing In the Heights? Maybe we’re powerless, a corner full of foreigners. Maybe tonight is our last night together, however! How do you wanna face it? Do you wanna waste it, when the end is so close you can taste it? I’m a fly this flag that I got in my hand! These lyrics defy color, race, and gender. It says at any point any one of us could have to leave because of the circumstances around us. We hope audience will see this show has a story to tell, and it is important to keep telling stories because that is how we learn and grow as a society. Kalyn: In the Heights tells a unique story, and it is a story that needs to be told. This show, as much as it is fun and makes a great night out, is important in that it tells this story about a group of individuals that are not frequently represented in musical theatre. This is a story that matters. I really hope, regardless of who our audiences are and what they identify as, that everyone can see a little piece of themselves in one of the characters or in something that is said onstage and be able to relate to the situation. Debra: This show not only tells the story of the younger people in the show, it also tells the story of the older people and their struggles. These struggles are things that most of us encounter at one point in our lives. I really hope audiences come away with the understanding that no matter how different we may be that really we are more alike. The character I play, Abuela, is the grandmother to the neighborhood, but she is not specifically anyone’s grandmother. A figure like Abuela exists in all communities and in all cultures. Diego: I hope that people leave this show and recognize the themes. I really hope people listen to what we are talking about, and understand why this show is important. I really hope people leave the theatre and think Art is important because we live in a world where a lot of other things are primary, but Art is really necessary to thrive as a community and society. People do not always find the need to support the Arts, they do not stand behind it, so I hope people see the show and realize how Art stimulates a conversation. Debra: Live theatre is important because it makes you feel. It is the idea of sitting in a big room with a whole lot of people and seeing these stories emerge onstage. This makes you feel something whether it is joy or empathy or sadness. Feeling these emotions is just important, it is important for your health and it is important for us as the human race. Live theatre is a celebration of being human. Kalyn: I agree with that, and live theatre is sacred. Every single night you walk into a theatre it is a different show. If you see the show today you are seeing an isolated event because the audiences’ reaction change with every show. You can never repeat it because it is live, it is a living and breathing organism that is changing and evolving with every show. Every night is an exclusive show, no one else will see the same show you see on a different night. There is something magical about that many people coming together, sitting in silence, putting their phone away and forgetting their problems for a few hours, and just being present and willing to go along on the journey with us so we can tell this story. I have always thought of the audience as the final cast member, something just clicks into place because you can feel the energy from the audience and that energy from the audience is what brings the whole thing to life. Daniel: In an age where everyone is constantly on their phone or some other form of digital media, it is wonderful to sit down and be forced to watch humanity take place three dimensionally onstage. Frequently we get lost in our own minds due to preoccupations and concerns with how we are perceived in part due to social media being such a huge part of our lives, so taking time away and watching people be human onstage is important. Watching live theatre makes people sit down and take a breath and experience things with other people. Everyone takes in the live theatre show and either learns something about themselves or other people. Diego: People coming to the theatre is a reflection, art reflects life. People can unconsciously look at themselves in live theatre. In live theatre everyone is sitting together and breathing together and holding their breath at the same time. People really take the time and stop to make a connection with people, they look into the eyes of the actors, and they are paying attention and making connections. Everyone in that room are sharing in the emotions and experiences of the show. It is about all of us coming together and being together in the room without the phones and without distractions. We are all in the same room together being humans. In the Heights runs at the Fulton Theatre through April 4, 2017. For more information and tickets please visit their website at www.thefulton.org or call the box office at 717-397-7425.